If you use live bait, you might want to make a bait tank. Live bait is used for catching many large predatory game fish. A bait tank can help you keep bait fish alive until you are ready to use them. You can purchase a commercial bait tank or make one yourself. You will need a container for the bait and water; this forms the basis of your bait tank. Plastic is best because it is lightweight. A bait tank filled with water and fish can be quite heavy; water alone weighs 8 pounds per gallon. Choose a container with manageable size and weight. White plastic is preferred because it helps reflect heat away from the tank. You should choose a container with a lid to keep fish inside. You could use a 20-gallon plastic trash can for your container. 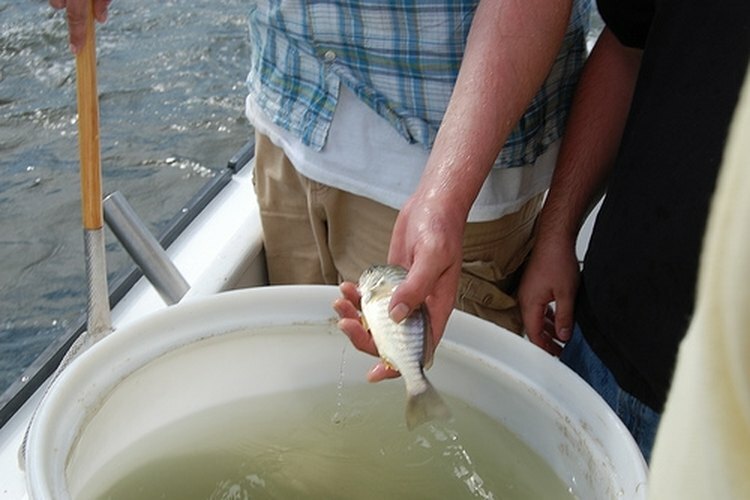 Without oxygen in the water, your bait fish will die. The best way to keep the water oxygenated is to use a submersible pump. Aquarium systems use a pump and filter, but filtration is not essential for a bait tank. The only filter you need is one that prevents the fish or waste from getting into your pump equipment. Pumps are electrical equipment, so observe all proper safety precautions to prevent injuring yourself or others. How you construct your bait tank will depend on the amount of space it can occupy on your boat. Specifically, you may need a submersible pump that will fit inside the tank, or you may have room for a pump outside the tank. If the pump is not submersible, you will need to create an opening near the bottom of the tank for water intake. Use an appropriately sized drill. The intake should have a screen cover to prevent fish or dirt from getting into the pump. To return the water to the tank, you can either create an opening near the top of the tank to return the water, or just use a hose to pump the water back into the tank. The advantage of using a hose is that you can also use it pump the water out of the tank for cleaning. Fill your tank with water and make sure the water is circulating properly before you attempt to use it with bait. Before you add fish to your tank, fill it with water of the appropriate temperature. Add chemicals to remove chlorine if you are using water from a commercial source. You may wish to use chemical products like bait saver which help keep your bait fish healthier. Some fishermen like to use pickling salt; it dissolves easily and helps preserve the slime coating of bait fish. Avoid touching the bait fish.